The Chilema Ecumenical Training and Conference Centre (CETCC), previously known as The United Church Lay Training Centre, is a non profit making ecumenical institution. It is a consortium owned by three mainline churches in Malawi namely, the Church of Central Africa Presbyterian (CCAP) Blantyre Synod, the Anglican Diocese of Upper Shire (ADUS) and the Churches of Christ in Malawi (CCM.). It is 1.5 kilometres from the M3 Blantyre -Zomba -Lilongwe Road and it is just below the beautiful Malosa Mountain. The ecumenical centre, CETCC is a dream of C.C.A.P Blantyre Synod and the Anglican Diocese of Upper Shire (ADUS) then the Diocese of Southern Malawi (DSM). The ADUS is of the Central Africa Province of the Anglican Church. The centres inception dates way back in 1960 through the innovative leadership of Reverend Jonathan Sangaya of the C.C.A.P then with responsibilities of General Secretary of C.C.A.P Blantyre Synod and the Rt. Reverend Bishop Donald Arden (retired) of the Anglican Diocese of Upper shire (ADUS) then Diocese of Southern Malawi respectively. Chilema Ecumenical Training and Conference Centre was officially opened in 1967 although the capacity building leadership training programmes started in 1964. "The Trinity of God Father, Son and the Holy Spirit. No one can live separate from others. Each one of us is a part of the whole. The wholeness is broken if one of us is missing. One faith, one baptism, one hope, one God." The name of "Chilema ETCC" has been associated with the ecumenical leadership training of Christian men, women, youth and children for over 40 years. 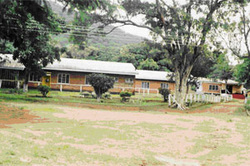 Since its inception, Conferences, consultations, synods, training courses, seminars, retreat camps, board meetings, consortium caucuses, women guilds orientations, colloquia both local and international have taken place at Chilema and the influence of these activities have effectively contributed to the development of this country - Malawi. It has facilitated the social transformation of thousands of men and women, youth and children of all races and from different religious and cultural backgrounds. THE NAME 'CHILEMA' AND ITS THEOLOGICAL MEANING. The name 'Chilema' is a Chichewa name for a 'cripple' (disability). Why should a place be called 'disability' when it has ability to train leaders? The Centre draws its name from two unique features. The first feature is a small stream or brook that flows from the top of Malosa Mountain. Unlike other brooks, which start as small streams from the source and widen and become bigger as they flow down the mountain, this one started as a big and wider stream at the source and grows smaller or narrower until just below where the Centre is located where it has completely disappeared. Local people called the stream 'Chilema' for it is like a cripple. The second feature which is very meaningful is the peculiar tree, nicknamed "walking tree". This tree, which is right at the Centre, close to both Chapel and Conference hall grows quite uniquely. The roots come out from the ground and form a tree whose branches would go down again to form roots and again until it has covered a wider area hence the influence of Chilema ETCC's trainings. Theologically, one would choose to agree that no one is perfect but God alone. Meaning that everyone in one way or another is crippled hence needs a bit of panel beating. Chilema ETCC accepts shortfalls in men and women, old and young and believes that to take a role of helping to overcome some of the shortfalls requires training. That is why Chilema is committed to running different programs and makes sure that its influence reaches a wider area. 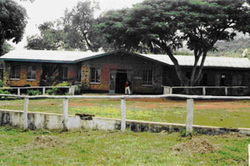 Chilema Ecumenical Training and Conference Centre (CETCC) is a brain child of legally established and registered denominations in Malawi namely Anglican Church Diocese of Upper Shire (ADUS), the Church of Central Africa Presbyterian (CCAP) Blantyre Synod and Churches of Christ in Malawi (CCM). These are some of the well respected, reputed and recognised denominations in Malawi. Chilema ETCC has got its own constitution which guides the operations of the programmes of the Centre in its endeavors. The Chilema ETCC is governed by the Board of Trustees of high repute from the three main line church members of the ecumenical group. The Board of Governors has the sole responsibility for the management of the Centre in liaison with the sitting appointed Executive Director. The Board of Governors meets thrice a year excluding emergency meetings. Current Board of Trustees Chairperson is The Most Reverend Archbishop Dr. Bernard Malango of the Anglican Diocese of Upper Shire (ADUS). The Board membership is co-headed by the sitting high offices heading the three mainline churches, the General Secretary of C.C.A.P Blantyre Synod, The General Secretary of the Churches of Christ in Malawi and the Archbishop of the Central African Province of the Anglican Church - Diocese of Upper Shire chairs the Board of Governors. Other Board members are appointed from the respective churches of various responsibilities with relevant professional backgrounds and their commitment. Also included are the representatives of the Lay Christians who are put in the Board to serve the interest of their congregations. This is done to take on board all key social groups into the ecumenical centres management so that it can perform to its expectations in meeting the needs of the ecumenical consortium member churches. A society growing spiritually and God fearing with necessary resources and capacity effectively responding to individual needs of church leaders, children, youth, orphans, women and men living in a conducive environment for humankind development and church growth. CHILEMA ETCC MISSION STATEMENT: To strengthen the ecumenical three mainline church consortium members in CCAP Blantyre Synod, Churches of Christ in Malawi, Anglican Diocese of Upper Shire and obligations response to community living and HIV/AIDS programme through high level advocacy, social mobilisation, pastoral clinical education, ecumenical evangelism, HIV/AIDS counseling, integrated home care, youth peer education, women capacity building, support programmes, promotion of girl child education, child protection, development and resource mobilisation, capacity development, life skills training, partnership building, networking, knowledge and information sharing among ecumenical participating churches and local community to sustain targeted individual and national development. To increase knowledge and skills among all people in the three main line churches on HIV/AIDS prevalence, prevention, care and support programmes with those infected, affected and the impact of AIDS and on issues of concern. To provide a centre for child care, rights protection and development of children in the absence of parents and guardians. To improve church leadership through capacity building programmes to the church elders, reverends, deacons, women guilds, youth and children for greater participation and church growth. To prepare and promote the school, intellectual, emotional and physical growth and development of children through provision of early childhood learning stimulation development before primary school education. To provide vocational training and other employable skills to older orphans, vulnerable children and youth with disabilities for their livelihood and bright future. To promote coordination among the three main line churches through ecumenical networking, retreat camp, synods, exchange visits, information sharing, pastoral clinical education, facilitation, counseling, shared resources, promotion of human rights. Good governance, for all congregations and in respective communities. To create a conducive environment for better living among all people. The Chilema ETCC carries out the following specific programme of activities in order to achieve the stated objectives of the centre. The Chilema ETCC runs internal and external programs to train leaders in the three mainline member churches of the Anglican Diocese of Upper Shire, Church of Central Presbytery (CCAP) Blantyre Synod and the churches of Christ in Malawi. Some of the following topics are covered during the training: leadership, stewardship, evangelism and church growth, giving and tithing, Effects of HIV/AIDS, Family Life Education. The programme is implemented at the centre and outreach in member churches through a consortium approach. This programme trains women from various areas country wide. Participants are generally women with some young women out of school. The training focuses in home craft management skills which cover all aspects of domestic science and technologies including basics in agriculture and food security, food and nutrition, health and sanitation, basic HIV/AIDS information, housing and home management, business management skills, bible knowledge, human behaviour and communication skills. With this programme, the Chilema ETCC runs a John Leake Play Group, placed in the campus of Chilema village. The main aim of the play group is to prepare children for primary school education. Within this programme, Chilema ETCC has a child based care centre, which caters for orphans and the less privileged children in society. At the centre children are exposed to early learning stimulation for their development. Recreation facilities are provided at the centre to promote children to social entertainment. Also the centre prepares meals to feed the attending children during the day from Monday to Fridays. At this centre there are two care giver teachers with one trained care giver. The training is provided by the Malawi Pre School Association of Blantyre. There is a need to train additional care giver teachers and provide refresher and additional capacity building trainings for the child based care centre and play group teachers. Also great need is in the area of the supply of educational reference materials at the centre. This programme trains men, women, youth and children regardless of their religious affiliation to become effective leaders of their churches and respective communities and take an active role in development. The programme also equips men, women, youth and children with leadership skills, community participation development, HIV/AIDS counseling and ethics. The Chilema Ecumenical Training and Conference Centre (CETCC) has been associated with the ecumenical leadership training of Christians men, women, youth and children for over 40 years. Conferences, consultations, synods, training courses, seminars, colloquia both local and international take place at Chilema and the influence of these activities has effectively contributed to the development of this country - Malawi and the social transformation of thousands of men, women, youth and children of all races and from different religious and cultural background. Chilema is a beautiful location below Malosa mountain. It has the facilities of a conference hall, boardrooms, cafeteria/restaurant, guest houses, clean dormitories for accommodation for up to a maximum of 120 people, a kitchen, dining hall, a chapel for morning devotions,classrooms and administration block as well as a women's training programme management training facility and a John Leake Play Group for children. However, the centre is open for church, para church, civil society, community organizations, public events and government departments to use upon booking and confirmations. The centre has a modest charge sheet for the centre facilities.